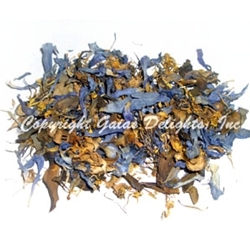 This is the high quality, organic, shade-dried Sacred Blue Lily of the Nile Dried Flowers and Tops that other sites sell for twice as much. Traditionally, a cigarette made of dried Nymphaea caerulea flowers was smoked during Egyptian ceremonies. Blue lily was held in very high esteem by the ancient Egyptians, who worshiped it as a symbol for the origins of life. The Egyptians believed that the world was once covered by water and darkness. A Blue Lily sprang up from the water and opened its petals to reveal a young god; a divine child. Light streamed from the divine child to banish universal darkness. This child-god was the creator, the sun god, the source of all life. When the pharaoh known as King Tut was entombed, his body was covered in Nymphaea caerulea flowers. Traditionally, a cigarette made of the dried flowers was smoked. Our Blue Lily Flowers are flowers and tops only and are suspected to contain the natural alkaloids aporphine and nuciferine. There are also reports from spiritual explorers that speak of the ritual usefulness of Sacred Blue Lily when smoked over several days, especially when the blue lily petals are combined with, or alternated with white lotus (Nymphaea alba) flowers. Historically the Blue Lily was used to treat aches and pains, improve memory, promote circulation, promote sexual desire, and has been used to support a natural sense of well-being. * Recent studies may support such beliefs as Nymphaea caerulea was found to be loaded with helpful phytosterols and bioflavonoids.